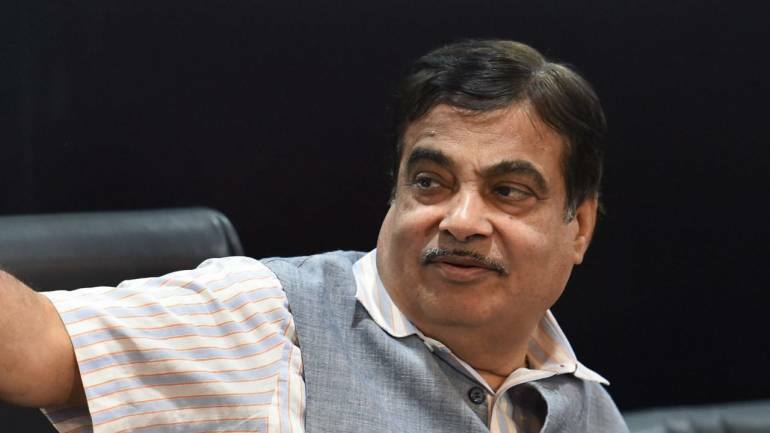 Union Minister Nitin Gadkari said there is no ‘220 club’ in the Bharatiya Janata Party (BJP) hoping for a reduced tally, which could see the emergence of an alternative to Prime Minister Narendra Modi. Speaking to The Times of India, Gadkari rejected any discussion of a possible alternative candidate and asserted that the party will return to power with a full majority under PM Modi’s stewardship. Gadkari’s name has often been the subject of speculation as an ‘acceptable’ candidate if the saffron party falls significantly short of majority. Gadkari expressed confidence that the development work done by the government would enthuse people to support the BJP and give them a second term. Most opinion polls between November 2018 and February had shown the BJP-led National Democratic Alliance (NDA) failing to secure a majority on its own. However, recent opinion surveys, conducted after the Pulwama terror attack and Indian Air Force (IAF)’s air strike at Balakot, show the NDA crossing the half-way mark on its own steam. For months now, reports have suggested that Gadkari — who is considered close to the Rashtriya Swayamsevak Sangh (RSS) — could be a consensus candidate within the BJP, if the party is required to seek external support to form the government. Speaking to the newspaper, Gadkari rejected the speculation. Recently, the Member of Parliament (MP) from Nagpur, played an important behind-the-scene role in ensuring the BJP retained power in Goa after the death of then Chief Minister Manohar Parrikar. In 2017 too, after the BJP failed to attain majority in the state Assembly polls, Gadkari had flown down to help the BJP cobble up an alliance with smaller parties in the coastal state, after which a government was formed under Parrikar’s leadership. Narendra Modi Video Conference: Without naming Pakistan, the Prime Minister said that the enemy is trying to destabilise us and carrying out terror attacks to stop India’s growth. Prime Minister Narendra Modi Video Conference: Prime Minister Narendra Modi on Thursday said that dismissed the ‘mahagatbandhan’ of opposition parties as ‘mahamilavat’. Addressing the party workers via NaMo app, he said that it will send the country to the Intensive Care Unit (ICU). “The grand opposition alliance, the mahagatbandhan, was highly adulterated, mahamilavat,” he said. He suggested that a loss for the party, like in 2004, will jeopardise development works and ease of corruption will replace ease of doing business. The Prime Minister also said 2014 was a mandate for fulfilling people’s necessities while the 2019 election will be about fulfilling people’s aspirations. Earlier, the Prime Minister cautioned against remarks that dent the morale of the security forces, adding that “India will fight, live, work and win as one and nobody can create hurdles in its march towards development”. He said that the country is grateful to all those who are protecting the nation. “It is because they (soldiers) are there, the nation can reach new levels of development,” he said. Without naming Pakistan, the Prime Minister said that the enemy is trying to destabilise us and carrying out terror attacks to stop India’s growth. “We all countrymen are standing like a rock to counter their evil designs,” he said. Prime Minister said that opposition parties are only serving their interest and it will send country to ICU. This is not Mahagathbandhan, this is Mahamilavat. “The Congress is joining the ranks with small parties to save its face,” he said. Taking a jibe at the proposed grand alliance of opposition parties, PM Modi said that the combination of Mahamilavat is like a combination of oil and water which renders both of them useless. “The parties which didn’t see eye to eye are now holding hands,” he said. Replying to a question PM Modi said that from 2014 to 2019, it was time to meet our necessities while the period between 2019 and 2024 will be about fulfilling expectations. Prime Minister said that today the country is talking about ‘new India’ and 21st century. ‘In the current situation, the first time voters play a crucial role. It is responsibility of booth level workers to reach out to the first time voter,’ he said. PM also lashed out at the Congress-ruled state government for not implementing Central schemes in their states. He said that the Congress is doing out of frustration. Modi said that several states haven’t shared the list of farmers to be covered under the PM-KISAN scheme. PM Modi further said that we have to be hardworking in all sectors, adding that India is grateful to all those who are protecting the nation. It is because they are there, the nation can reach new levels of development. Without taking name of Pakistan, PM Modi said that the enemy tries to destabilise us, carries out terror attacks, they want to stop our growth. “We all countrymen are standing like a rock to counter their evil designs,” he said. In a hard-hitting statement, Prime Minister Narendra Modi said: ‘India will live as one, grow as one, fight as one, win as one.’ The remark comes amid growing tensions between India and Pakistan. Prime Minister Prime Minister Modi said that the sentiments of the country are at a new level. He said that it is necessary to ensure nothing is done to dent morale of security forces. In a stern warning to Pakistan, Prime Minister Narendra Modi said that countrymen have full faith in the soldiers. He asked the people to encourage and keep the morale of soldiers high. Delhi Chief Minister Arvind Kejriwal has urged Prime Minister Narendra Modi to postpone his mega video-conference with BJP workers, saying the nation’s energy must be spent on getting the IAF pilot back from Pakistan’s custody. The Congress prty has slammed PM Narendra Modi over his proposed address the the BJP workers via video conference. Congress spokesperson Randeep Singh Surjewala alleged that PM Modi has misplaced priorities and that he was desperate only for re-election. BSP supremo Mayawati has lashed out at Prime Minister Narendra Modi over his video conference. In a tweet, she said that PM Modi should worry about the nation’s security first but he is busy with his party affairs. Meanwhile, the Congress has postponed its meeting in Gujarat. The Congress Working Committee (CCWC), highest decisionmaking body in Congress, was scheduled to meet in Gujarat today. This was the first time in after almost six decades, a Congress Working Committee meeting was planned in Gujarat. 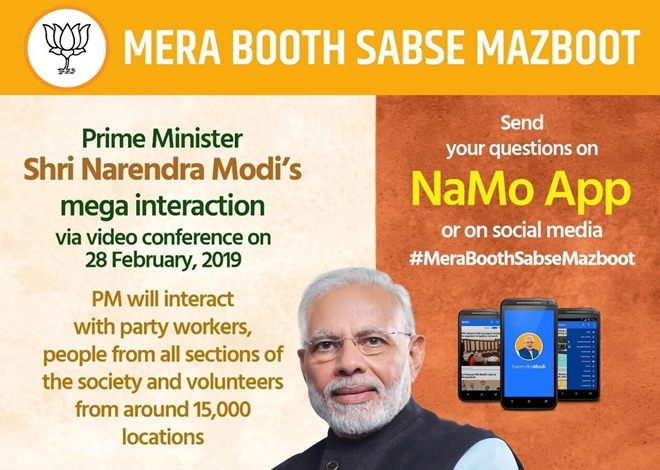 The BJP has said that one can send your question through NaMo app to the Prime Minister or using #MeraBoothSabseMazboot on social media. The video conferencing is a part of PM Modi’s reach out to the BJP workers to boost their morale ahead of the Lok Sabha polls. According to BJP president Amit Shah, PM Modi’s today event will be world’s largest video conference. The Prime Minister is scheduled to interact with over 1 crore BJP workers, volunteers and well wishers via NaMo app. People from 15,000 locations will speak to PM Modi. Union Cabinet ministers, Chief Ministers of BJP-ruled states and party office-bearers will also present at pre-identified places for the programme. The PM’s event will start at 12 noon. Meanwhile, BJP president Amit Shah is set to attend the programme at the party’s Delhi office. The event will start ar 12. Party workers from nearly 15,000 locations are likly to speak to PM Modi directly. The event also comes in the midst of of a stalemate in the ongoing conflict between India and Pakistan after one of the IAF pilots went missing in action. Pakistan has claimed that he is in their custody. The Prime Minister may touch upon the issue during his interaction with party workers. Just like 2014, the Bharatiya Janata Party (BJP) is once again banking on Prime Minister Narendra Modi’s leadership. The BJP is hopeful of retaining power and again form a majority government. The opposition parties, on the other hand, are flexing muscles to bury their differences and form a grand alliance to take on the BJP in the polls.